These days the BBC has many ways of engaging with it’s audience ranging from phone ins, texts into programmes, and of course Twitter and Facebook. 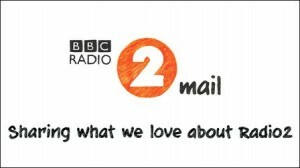 So, I found it refreshing that Radio 2 has recognised the power of email newsletters as an additional way of engaging with listeners. And they’ve executed it really well. Handpicked by our very own presenters. Each week, a different presenter will round up their favourite moments on Radio 2. They might even let you in on a few behind-the-scenes secrets! How could you use an email newsletter in your business to engage with your prospective clients and build brand awareness? I can help. Ask me how.